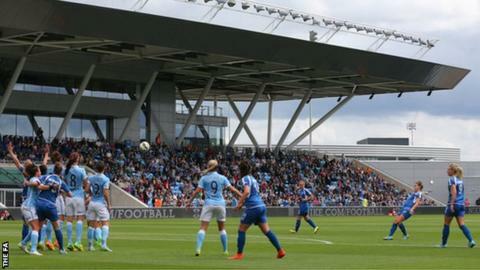 Women's Super League One crowds have seen a major increase from last season, the Football Association has announced. The top division of women's football saw an overall 48% rise, with the average league attendance being 1,076 compared to 728 in 2014. Newly-crowned champions Chelsea Ladies enjoyed the biggest gain with a 164% increase, while Sunderland were second with a 123% rise. Manchester City had the highest average attendance of 1,500. They also claimed the season's single highest attendance with 3,180 supporters at the Academy Stadium on Sunday, as City beat Notts County on the final day of the 2015 WSL 1 campaign. England's success at this summer's World Cup appears to have had a major impact on women's football, with attendances up by 29% compared to matches before the tournament. FA director of football participation and development Kelly Simmons said: "The sheer increase in attendances we've seen this season shows just what appetite there is for the women's game in this country. "2015 has been a landmark year for women's football, with the success of the England team at the World Cup and the first-ever SSE Women's FA Cup Final at Wembley, and this is another marker of just how far the game has come."